From the author of Ready Player One, a rollicking alien invasion thriller that embraces and subverts science-fiction conventions as only Ernest Cline can. Zack Lightman has never much cared for reality. He vastly prefers the countless science-fiction movies, books, and videogames he's spent his life consuming. And too often, he catches himself wishing that some fantastic, impossible, world-altering event could arrive to whisk him off on a grand spacefaring adventure. So when he sees the flying saucer, he's sure his years of escapism have finally tipped over into madness. Especially because the alien ship he's staring at is straight out of his favorite videogame, a flight simulator callled Armada--in which gamers just happen to be protecting Earth from alien invaders. As impossible as it seems, what Zack's seeing is all too real. And it's just the first in a blur of revlations that will force him to question everything he thought he knew about Earth's history, its future, even his own life--and to play the hero for real, with humanity's life in the balance. But even through the terror and exhilaration, he can't help thinking: Doesn't something about this scenario feel a little bit like...well...fiction? 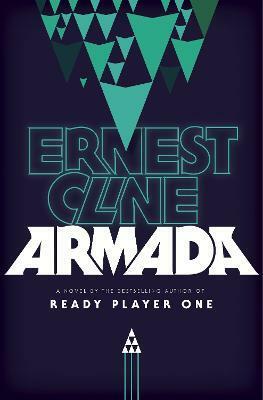 At once reinventing and paying homage to science-fiction classics, Armada is a rollicking, surprising thriller, a coming-of-age adventure, and an alien invasion tale like nothing you've ever read before. --Entertainment Weekly "Nerd-gasmic...another science fiction tale with a Comic-Con's worth of pop-culture shout-outs." "An amazing novel [that] proves Cline has the ability to blend popular culture with exciting stories that appeal to everyone." --Huffington Post "A joyous, rollicking read...will garner Cline an even larger group of fans than the formidable crew he's already assembled." "A great romp...Cline (ever the fanboy) is both reverent of and referential to the books and movies and games of his childhood." "Video games come to life in this witty, extraterrestrial thriller." --New York Post "Built like a summer blockbuster...Cline recombines the DNA of Ender's Game, Star Wars, The Last Starfighter, and old-school arcade games like Asteroids into something that's both familiar and unpredictable. It's a mutant homage to sci-fi tropes past." --Gawker "Hugely entertaining...a paean to the videogames of a bygone era, and like Ready Player One it is a tremendous amount of fun for anyone who remembers that time and played those games." "A novel so fun, you'll want to reboot it and read it again...the best novel this gamer geek has read in a long, long time." --Hugh Howey, New York Times bestselling author of Wool "Those conspiracies you imagined when you were fourteen turn out to be true in this masterful tale of Earth's desperate struggle against a powerful alien foe." --Andy Weir, New York Times bestselling author of The Martian "Armada proves Ernie Cline is the modern master of wish fulfillment literature - and of reminding us to be careful what we wish for." --John Scalzi, New York Times bestselling author of Old Man's War "With another winning teen protagonist in Zach, Cline mines the nostalgia and geek spheres just as successfully as he did in his acclaimed debut, Ready Player One. The works that obviously influenced the story line, such as Orson Scott Card's Ender's Game and the films The Last Starfighter and Star Wars, feel like homages rather than borrowings- a rap artist sampling the best beats our there to create an irresistible jam." --Library Journal, starred review "Cline once again brings crackling humor and fanboy knowledge to a zesty, crowd-pleasing, countdown-clock, save-the-planet tale featuring an unlikely hero, adrenaline-pumping action, gawky romance, and touching family moments....Cline's sly, mind-twisting premise and energetically depicted and electrifying high-tech battles make for smart, frenetic, and satisfying entertainment." --Booklist, starred review Praise for Ready Player One: "Enchanting...Willy Wonka meets the Matrix. Its geeky characters are geeky cool. And its action is imaginative, always cinematic. [Cline] even weaves a sweet romance into this hero-vs.-villain tale." --USA Today "The grown-up's 'Harry Potter'...the mystery and fantasy in this novel weaves itself in the most delightful way, and the details that make up Mr. Cline's world are simply astounding. Ready Player One has it all." --Huffington Post "A rollicking, surprise-laden, potboiling, thrilling adventure story...the best science-fiction novel I've read in a decade." --BoingBoing.com "Ridiculously fun and large-hearted... Cline is that rare writer who can translate his own dorky enthusiasms into prose that's both hilarious and compassionate. You'll wish you could make it go on and on." "A smart, funny thriller that both celebrates and critiques online culture... layered with inside jokes and sly references." --San Francisco Chronicle "An addictive read... part intergalactic scavenger hunt, part romance and all heart." --CNN.com "Incredibly entertaining...a geek fantasia, '80s culture memoir and commentary on the future of online behavior all at once."